In this edition we're showcasing 3D models by Panda Windows & Doors, Mid-America Siding Components, Nixalite, and OZCO Building Products. We've also gathered projects from SGi Lighting Inc, Envirolok, LLC, Norwell Outdoor Fitness, & Stop Spot LLC. Accentuates the height of the exterior with its smooth, elongated shape. Installation is easy with our wide nailing flange, levelling lines, adjustable stop gauge and snap-on trim ring. A wide variety of functional and decorative gable vents is available. Functional vents have a double baffle design for optimum aesthetics and protection against adverse weather. The sealed-in fiberglass screen offers complete insect and animal protection. E-Spike All American All Stainless Steel Spikes for pigeons and seagulls. 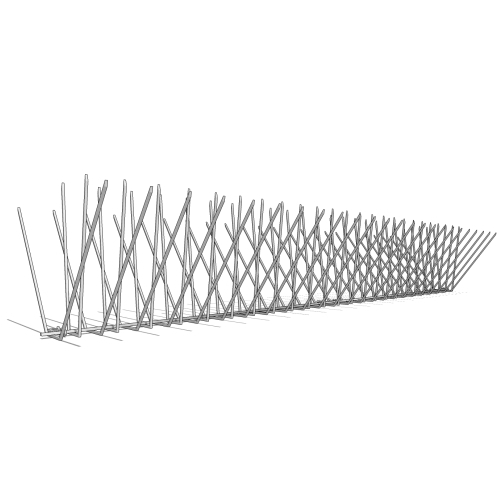 The E-Spike Full Row is 6" wide, 4" high and has 48 points per foot. Purchase in 2 or 4 foot lengths and with pointed or Soft Tip wire tips. MOUNTING HARDWARE IS NOT INCLUDED. At OZCO our passion and love is to manufacture the highest quality building products for DIY’ers to Pro, while providing How-To’s with step by step instructions for all types of Outdoor Living Structures including a Bill of Materials that are easy to use. Our hardware is designed and manufactured with innovative building breakthroughs so anyone that uses our products will be proud of their work and ours. Envirolok supplies a permanent vegetated solution to persistent erosion of slopes. Envirolok easily conforms to the natural contours of a slope compared to other systems. Envirolok also provides structural support that when combined with native vegetation allows the establishment of habitat along sensitive areas. The clients have an extended family that they entertain frequently. They needed a space large enough to accommodate family gatherings, but with intimate features that enabled interactions with small groups. Hence, the dining and bbq spaces are open and generous, while the sunken lounge and firepit areas feel enclosed and cozy. The transition from the large paved area to the two sunken features was key in unifying the three spaces. In the center of the space, the bubbling rock creates a playful focal point – who would expect a grouping of natural rocks and grasses in the middle of a formal Travertina patio? To blur the division of two mediums, the slabs were exploded to permit the rocks to push into the patio, creating an unlikely marriage that delights the eye. The result is a look that is clean and classic, and at the same time, free-form and casual. Stop Spot LLC caters to the North American market by sourcing modern and unique products to make locations exceptional through innovative ideas while providing a fresh, distinctive look that cross over all architectural styles.